In the retro clothing style arena there are two clothing shopping options: true vintage, which is when you purchase clothing made in the original era, and reproduction or ‘repro’ clothing, which is clothing that has been designed and produced (often on a mass scale) in the style of the fashion from a bygone era by a modern company. The benefits of buying one or the other type of clothing depends on your clothing needs, budget and your taste. Vintage clothing can vary in price and quality, depending on where it is purchased and how well the item has been taken care of over the years, and while many people proclaim it is perfectly possible to find plus-sized vintage clothing, I myself have always struggled to find items I like within my budget that would actually fit me (and I’m a modern UK 12/14, technically not even plus-sized.) This problem with sizing is one of the main benefits of reproduction clothing, as modern designers realise that the modern woman typically doesn’t fit the same proportions as our glamorous 50s counterparts. Thus, repro clothing is thankfully made in a variety of sizes, and it is repro clothing brands that I’ll be providing a summary of in this post. I’ll be telling you what kind of items each brand produces, the size scale, the price scale, where the brand is based, and where you can buy their items. A tip before we begin: if a website or brand you come to love has an email newsletter, sign up. They’ll often let you know when they’re having a sale. Likewise, Instagram and Facebook is a great way to follow your favourites too, because they will often announce sales or discount codes there as well. Fair warning: when becoming a pinup you will fall in love with an item (or several) that is way outside of your typical budget. This will happen. It’s inevitable, no way around it. There are just too many beautifully designed clothes out there. I always find there’s several ways to deal with this. 1) Start saving. 2) Cross your fingers for a discount code to pop up with which you can make a saving on the item. 3) Wrack your brains for an appropriate upcoming event at which you might be able to wear said item of clothing and purchase it for that (Hellooo finally buying the Alika dress by Tatyana designs for my cousin’s wedding!) 4.) Or, the saddest option, but also my most used, is to keep revisiting images of the item so often, putting it into and taking it repeatedly out of your online shopping bag, that eventually that I Must Have It YOU DON’T UNDERSTAND burn starts to slowly die down to embers because you have repeatedly binged on the idea of the item and have almost tricked your brain into feeling satiated. Pinup Girl Clothing – Med price range, large variety of styles and prints, separates/dress/shoes/accessories/outerwear/swimwear, wide size range of XS-4X. US based, available on their website and stocked through select other websites and pinup boutiques. One of the most popular global pinup brands (and my particular favourite.) Regular sales and discount codes available across the site, with early access to their newsletter subscribers and Instagram followers. Hell Bunny – Low price range, this brand is half alternative clothing and half retro inspired. Separates, dresses and petticoats, sizes UK 8-24. With no website of their own, Hell Bunny is available through a variety of online stockists, often sold through eBay sellers, and available in pinup & alternative stores. UK based. Vivienne of Holloway – High price range, separates/dresses/petticotes. UK based, sized according to vintage sizes VOH list their sizes online by providing the garment’s measurements and allowing you to choose the right size according to your own measurements, stocking for waist measurements 24inches – 38inches. Available through their own website, own flagship boutique, and select other pinup boutiques globally. 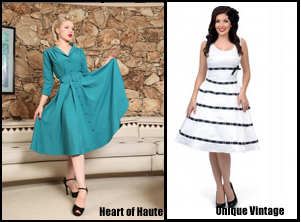 Collectif – Mostly low price range, separates/dresses/outerwear/accessories, sizes UK 6-18, and up to UK 22 selectively. UK based, available through own website, own boutique chain, and through select pinup boutiques. Lady V London – Low price range, separates/dresses/petticoats. Wide size range, UK 8-32. UK based. Available on their own website, own boutique, and select stockists. Steady Clothing – Low price range, separates/dresses/accessories and guys retro clothing too. Sizes S-3X. US based, available through their own website and select stockists. Stop Staring – High price range, dresses/separates. Sizes XS-3X. US based. Available through own website, own LA store, and select other stockists online and in pinup boutiques. Voodoo Vixen – Low price range, separates/dresses/playsuits/bags. UK based, sizes UK 6-16 (XS-XXL.) Available through their own website, variety of online stockists, many eBay sellers, and some pinup boutiques. Lindybop – Low price range, dresses/separates/petticoats. UK based, sizes UK 8-26. Available through their own website and widely stocked online by eBay sellers and other websites internationally. Bernie Dexter – High price range, dresses/separates/swimwear designed by the famous international pinup model Bernie Dexter herself. US based, sizes XXS-5XL. Available through own website and other pinup websites. Tatyana Designs (formerly Bettie Page) – High price range. Separates/dresses/swimwear/outerwear/shoes and men’s shirts, and a small line of clothing designed by Dita Von Teese. US based, sizes XXS-4X. Available through own website, own boutique line, select boutiques and select online stockists. Includes online outlet store on their official site where you can buy end of line items for a fraction of the price. Wheels and Dollybaby – High price range. Famously includes the Dita Von Teese keyhole cardigan range exclusive only to this Australian brand. Sizes UK 4-14. Available through their own website, select pinup boutiques internationally, and select pinup websites. Unique Vintage – Med to high price range. Sizes XS-6X. US based website that stocks own Unique Vintage brand as well as a large selection of repro clothing from other brands, covering dresses/shoes/accessories/swimwear/prim dresses as well as true vintage items. Often offers discount costs or free shipping to US domestic orders, but sales are less often applicable to us international customers. Still, it’s worth signing up for the newsletter as they did recently have a sale in which I got 50% two $110 dresses, which is nothing to sniff at. Heart of Haute – Med price range. Dresses/separates/accessories/shoes/bags. US based, sizes XS-2X.Sales rack hosted on a separate website (here) for deeply discounted items. If you google websites selling pinup/retro/50s/vintage clothing you’ll find hundreds of websites stocking a variety of brands internationally, but there are a few large retro clothing websites that stock a variety of brands, such as Unique Vintage above. One of such that lists many brands but does not host their clothing brand is Modcloth, which I thought I’d also detail for your below. Modcloth – A popular website that does stock some repro brands, like Bernie Dexter, Hell Bunny, etc, but renames the items from only some brands with their own cutesy stock name. Which is, yes, cute, but incredibly annoying if you’ve found an item you want (by, say, Hell Bunny, which they stock but don’t list by name) and you see that they don’t have it in your size, you would then be at a loss as to what to enter into your search engine in order to summarise where else you might be able to purchase the same item with your size in stock. In addition to the true repro brand stock, they also stock a large (and I do mean large) selection of vintage inspired items that are more modern (think shorter length dresses, for example) and other regular modern clothes. Newsletter sign up regularly includes access to sales. In addition to all that’s listed above, there’s also a myriad of Etsy stores on which people stock handmade repro clothing, but that’s a whole other subject for another time. Hopefully you pinup novices will feel better equipped with the information I’ve provided for you to begin your retro clothing journey, but if any pinup pros have noticed any big brands I’ve missed then let me know and I’ll add them. What are you waiting for? Go begin crafting your lust-lists! This entry was posted in Clothing Reviews and tagged 50s, beginner's guide, collectif, hell bunny, pinup, Pinup Girl Clothing, retro, retro clothing, rockabilly, style by missamymay. Bookmark the permalink. I love this article! But I noticed when you click the Lindybop link, it sends you to lindybop.com, while the url for the brand is lindybop.co.uk.